It is also a mandatory step for projects willing to enter the [https://polarsys.org/wiki/Maturity_Assessment_WG PolarSys Maturity Assessment], as the analysis process relies on code metrics extracted by Sonar. 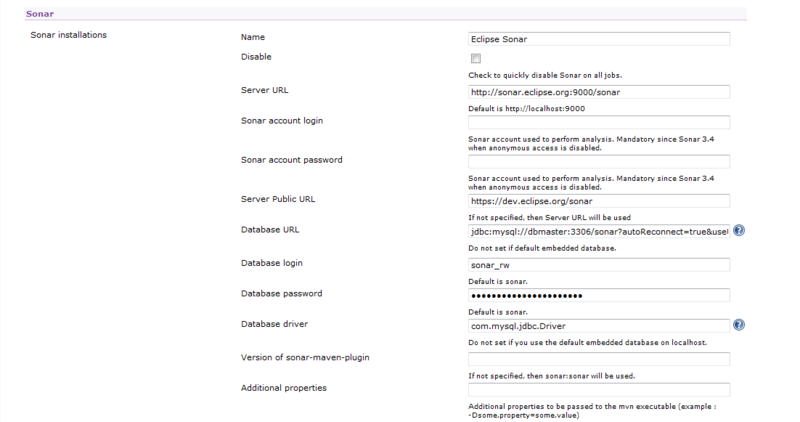 Sonar can be found on https://dev.eclipse.org/sonar . [https://dev.eclipse.org/sonar/all_projects Several projects] already have quality reports enabled. You can drill-down on code to see Sonar annotations on each class, or navigate through the different widgets on the dashboard to focus on specific issues. A dedicated job has to be defined for the quality analysis -- because you don't want to execute Sonar everytime the project is built. In the update center, install the Sonar plugin and restart the Hudson instance. In the job configuration, check the Sonar post-build action, click on advanced and fulfill the fields according to your project configuration. The following example screenshot shows the [https://hudson.eclipse.org/emfcompare/job/master-quality/configure configuration used by the emf-compare project]. Then [https://bugs.eclipse.org/bugs/enter_bug.cgi?product=Community post a new bug entry in the community bugzilla] to ask an administrator to add the Eclipse Sonar instance parameters to the Sonar plugin.